The VOXHERMES electronic newsletter is no longer active. However, subscribe to VOXHERMES, to view the archive of posts and files. 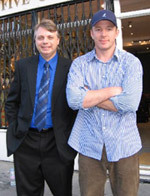 Mark Stavish (on left), Director of Studies for the Institute for Hermetic Studies with Producer/Director Guy Ritchie (right) after taping an interview in London for Ritchie's upcoming feature length film on esoteric wisdom and teachings. Copyright© 2001-2017 Institute For Hermetic Studies.